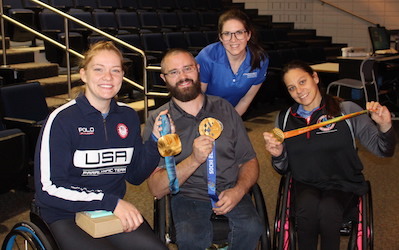 UT Southwestern Medical Center is proud to sponsor the third annual UT Southwestern Adaptive Sports EXPO, held Saturday, October 5, 2019, on the campus of UT Arlington. This free event is designed to increase awareness of adaptive sports and promote active, healthy, and engaged lifestyles. People of all ages and ability levels were invited to attend. For more information on the UTSW Adaptive Sports Coalition and our partners, please visit our Facebook page. You can also visit our Facebook event page. For any questions about the event, please email us at AdaptiveSports@UTSouthwestern.edu. See what it's like at the Adaptive Sports EXPO. The Adaptive Sports EXPO is brought to you by the UT Southwestern Adaptive Sports Coalition, a group of volunteers from organizations in the Dallas/Fort Worth area with a shared interest in adaptive sports. Members of the Coalition acknowledge the multiple health and psychological benefits of adaptive sports participation and hope to make adaptive sports opportunities more accessible to everyone. "As a rehabilitation psychologist, I am interested in adaptive sports because of the impact it has on one’s quality of life and overall well-being. I am a strong believer in physical activity and exercise as medicine. Psychological health and wellness are some of the greatest benefits of sports and physical activity, because regular participation improves mood and reduces anxiety. Finally, adaptive sports are an excellent way to engage in the community, socialize, and simply have fun with folks with similar interests." "I am a board-certified physical medicine and rehabilitation physician and sports medicine specialist. I see patients in a specialized sports medicine and musculoskeletal rehabilitation clinic in Las Colinas. As a former modern dancer and a current endurance runner, I understand how important sports and exercise can be for physical and mental health. As a type 1 diabetic, I also understand what it feels like to be restricted by your medical condition, especially when it comes to sports and exercise. I truly believe “if you have a body, you are an athlete” and my goal in the field of sports medicine and in this coalition is to empower individuals of all abilities, skill levels, and interest to find their inner athlete. By doing so we can improve the health and quality of life of all members within our community." "I am a pediatric sports medicine physician at Scottish Rite Hospital’s Sports Medicine Center and an Associate Professor in the Departments of Orthopaedics and Pediatrics at UT Southwestern. The benefits of sports participation are numerous and include physical, psychosocial, and health-related benefits which positively impact lives. As a sports medicine physician, I encourage exercise and physical activity for everyone. Adaptive sports opens the world of sports participation to a population that routinely overcomes challenges in their daily lives and benefit greatly from their participation, while demonstrating their incredible athletic talents. My goal for being involved in this coalition is to introduce new opportunities to those who may not be aware of what opportunities exist in the community for them." "I am a board-certified physical medicine and rehabilitation specialist working in both Fort Worth and Dallas with a special interest in sports and musculoskeletal medicine. DFW holds a special place in my heart having grown up and trained largely in this area. My training uniquely suits me for addressing the medical needs of adaptive sports athletes. Dr. Kathleen Bell and I recognized last year it was unusual that nobody seemed to be focusing on the care of the local and regional adaptive sports community which also seemed to be very loosely organized, and primarily run by a handful of very dedicated individuals with somewhat limited resources. We knew that there was some way we could help bridge the gap between the broader DFW community and those patients unaware of adaptive sports opportunities, with the close knit adaptive sports community and the many services and companies that cater to this community. Dr. Bell’s addition of some key new faculty members with strong similar interests gave us the network and physical manpower to bring this vision to life in our new adaptive sports coalition (ASC). One of our first initiatives was the bright idea of Dr. Jason Smith, and that was to plan an adaptive sports expo which could bring our efforts to light, and kick start the effort to really bring the community at-large (current and potential athletes, families, organizations, medical services and providers, educators, and interested community members) together. I am excited about our momentum and enthusiasm, and the potential for what we can accomplish by serving as the hub for this endeavor." Robert Rinaldi, M.D., is division chief of pediatric rehabilitation medicine at Children’s Health. After receiving his medical degree from the University of Oklahoma College of Medicine, Dr. Rinaldi completed a residency in general pediatrics at Children’s Mercy Hospital in Kansas City, and a residency in physical medicine and rehabilitation at the University of Kansas School of Medicine. Dr. Rinaldi’s clinical interests include brachial plexus and peripheral nerve injury management, torticollis management, musculoskeletal disorders in children, and rehabilitation in neuromuscular disorders. His research interests include rehabilitation management of brachial plexus injuries. Dr. Rinaldi has served on numerous national committees, including the Pediatric Subcommittee of the American Board of Physical Medicine and Rehabilitation, and the Board of Governors for the American Academy of Physical Medicine and Rehabilitation. As a lifelong athlete himself, he has held belief in the benefit of physical activity and sport in children with disabilities. He sees the Expo as an opportunity to facilitate this belief and as yet another way to influence lifelong health for children. "I am an Assistant Professor at The University of Texas at Dallas in Bioengineering and UT Southwestern Medical Center in Physical Medicine and Rehabilitation. After attending college at The University of Texas at Austin to study mechanical engineering, I pursued research in the Center for Bionic Medicine at the Shirley Ryan AbilityLab (formerly the Rehabilitation Institute of Chicago) and Northwestern University’s Feinberg School of Medicine. My research focuses on the biomechanics of human movement and informed design and control of prosthetic and orthotic technologies for human assistance, with an emphasis on demanding forms of human locomotion such as recreational sports activities. In the past, I have examined how individuals with transtibial and transfemoral amputation move and how the application of both conventional and robotic knee-ankle-foot prostheses may enhance mobility and quality of life. I am excited to have helped and continue to help build a culture where DFW adaptive athletes can feel supported and search for ways that engineering technologies may help." Special thanks to some of our UTSW Adaptive Sports Coalition members who helped make this event possible: Darlene Hunter; Doug Garner; Ron Davis; Dana Dempsey; Robert Rinaldi, M.D. ; Kathleen Bell, M.D. ; Nicholas Fey, Ph.D.; and many others! We'd also like to thank the American Medical Society for Sports Medicine (AMSSM) for their support.